Biography & Genealogy: John Cabell Early, Class of 1867. New Market Cadet. Private, Company C, New Market Corps; Genealogy: Born- February 29, 1848 in Charleston, WV. Father- Capt. Samuel H. Early; Mother- Henrian Cabell. Pat. Grandfather- Col. Joab Early; Pat. Grandmother- Ruth Hairston. Mat. Grandfather- Dr. John Jordan Cabell; Mat. Grandmother- Henrian Davies. Married: Mary W. Cabell. Children: five children; youngest child: Jubal Anderson Early, VMI, 1907. Matriculated to VMI from Lynchburg, VA. At VMI 12 months over 2 years. 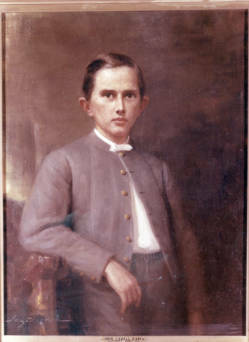 Military Record: unofficial source says he served as a Courier in the Army of Northern Virginia during the summer of 1863; entered VMI during December, 1863 as a Private with Company C, but remained at VMI on guard duty when the Corps left for New Market (most likely due to illness); served with Corps of Cadets in Richmond trenches until it disbanded on April 2, 1865. Post War Career: Farmer, lumberman, merchant. Died- June 25, 1909 in Campbell County, VA. Nephew of Confederate Lieutenant General J.A. Early.